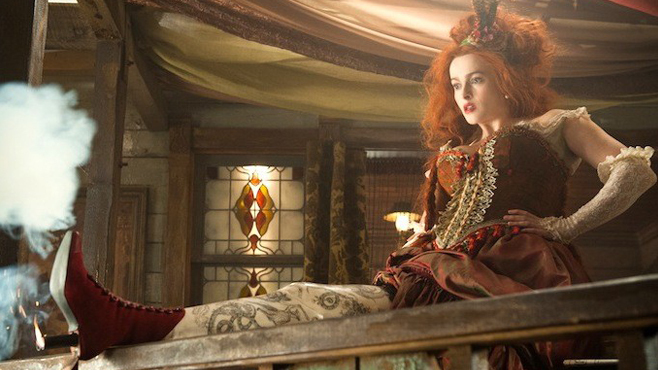 Starring: Johnny Depp (Pirates of the Caribbean), Armie Hammer (Mirror Mirror), Helena Bonham Carter (Les Mis) and more. Rated: Rated PG-13 for intense action, violence and suggestive material. Johnny Depp and Armie Hammer star as the classic duo in this adventure from Disney under the direction of Gore Verbinski (Pirates of the Caribbean and Rango). This origin story gives an insightful background on the beginnings of the “masked man” and his sidekick Tonto. 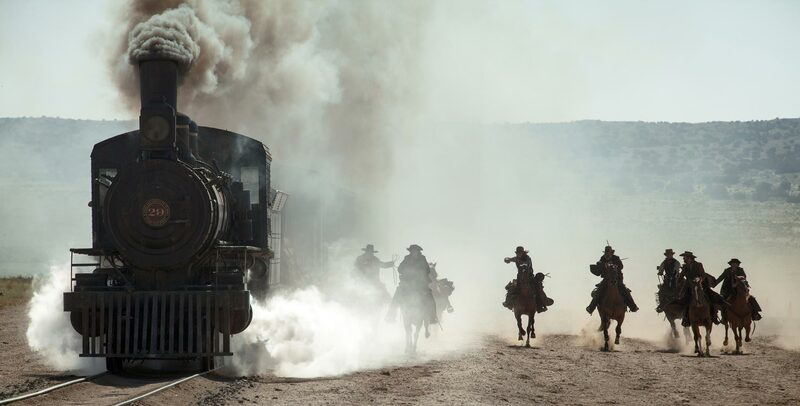 Does The Lone Ranger give audiences a good reason to once again visit the wild west? or will it cause audiences to wish that it went like his horse, Silver…”Away”? 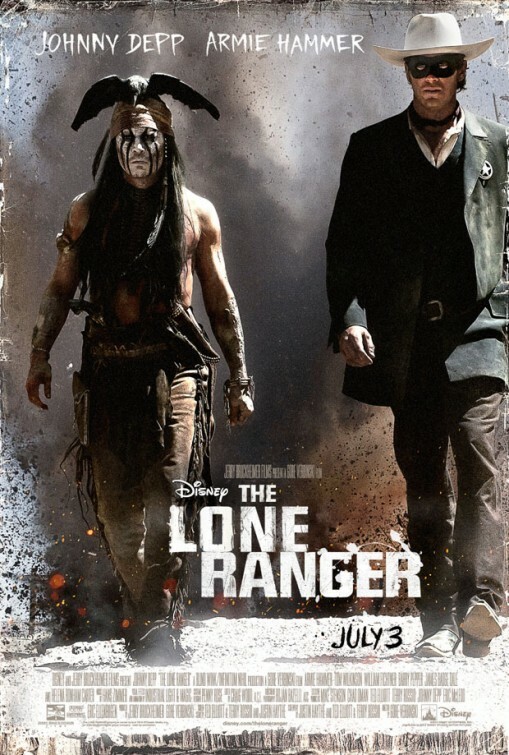 Borrowing much from The Pirates of the Caribbean franchise, The Lone Ranger entertains (mainly due to Depp) yet never ends up near as funny or interesting. Much like a carnival magic show, plenty of things happen to confuse or delight you, but nothing of note actually takes place. 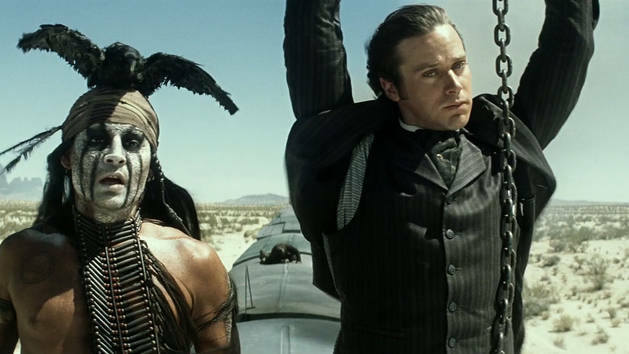 Disney took the Lone Ranger, a symbol of justice, and did an injustice with this visual version full of disappointing CGI and intermittent borderline racism. Mindless, nonsensical and often disengagingly boring, families may enjoy this film with the bit of wit and western style action it contains. Though it would better be entitled “Tonto & The Search for The Lone Ranger,” if asked to go see this film again, I will reply “Hi-yo, Silver, NO WAY!” I really felt like I wasted my time watching this one with the exception of looking for three of my friends throughout in the background scenes of the movie. Looks like I am right so far with my list of disappointing films of the second half of 2013. We’ll see how the rest of these six months go. 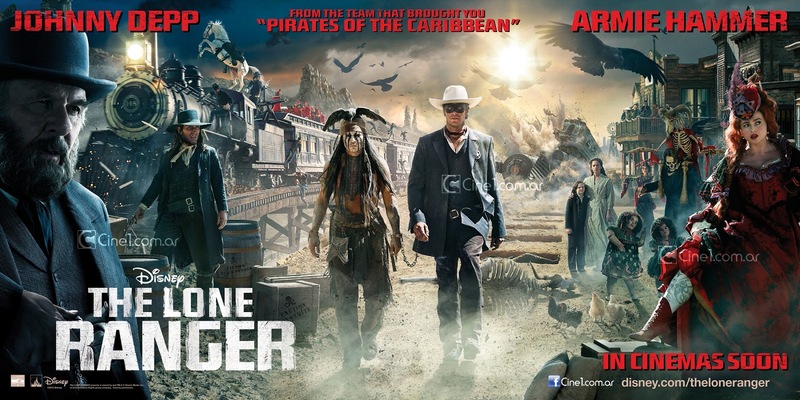 The Lone Ranger was worse than expected…and I already expected it to be bad. Previous “It’s Time to Vote Tuesday” 156! Thank you for saving me $10, T. I probably would have wandered into this at some point. So much time, money and energy that could have gone into something original and interesting. no problem, Paula. Thanks for reading. I am sure some reviewers will be kinder to this film than I, but I saw no point in candycoating the problems I saw. It’s not a western, not a comedy, not…anything. It doesn’t know what it wants to be except a cowboy-ish version of POTC (and probably just the sequels at that). Meh! As much I like Johnny Depp, this one did look like Pirates of the Caribbean just a la western style just from the trailers. Now that you mentioned Gore Verbinski as the director, I guess the style makes sense 😉 Great review! ha. You hit the nail on the head! Same director. Good eye for the style. I don’t get the appeal for Johnny Depp too much anymore. But I do like the first Pirates of the Caribbean! That you for seeing and critiquing a film that has rubbed me the wrong way since initial talks began. As a child of the 1960s. Just as if there isn’t some guy in a rubber suit tearing up cheap Toho Studio balsa wood and rice papers sets of downtown Tokyo. It AIN’T Godzy! If the film doesn’t start with Rossini’s ‘The William Tell Overture’ and star Clayton Moore and Jay Silverheels riding all over old Republic film sets. It AIN’T The Lone Ranger! 🙂 Thank you for the kind compliment. Yes, this one was not a winner in my book not at all. It plays the William Tell Overture during a scene that is less exciting than the music itself. just…meh. Wow, pretty damning! My dad wants to see this being a big fan of the original stuff, so I’ll be going along with him. I think I’ll take a book. if he is a big fan of the original, then I fear what he will think of this one. Take your book…and cover his eyes! I was thinking of seeing it this weekend but with a super low 20% rating on Rottentomatoes and your review, I’m skipping this turkey. It’s no wonder Disney decided not to heavily promoted the film, I mean I didn’t know it opens this week until I saw the ad on TV Sunday night. I guess they realized they’ve got a bad film on their hands and just promote it as little as possible and save some cash, LOL. Unfortunately I ended up seeing it, my lady and I couldn’t figure out what to do last Friday night so we went to see it. We saw it at one of the most popular movie theaters in MN and there were only 5 people in the theater including us and it was a Friday night! So yeah the film was tanking big time. But I didn’t hate it like most critics, I thought it was okay, just too long and the tone was so uneven. Nice review, terrence. The LAME Ranger indeed. Guffawed at that, my friend. Look, I’ve read a lot of trash about this film, most of it stemming from people’s lack of interest in a Pirates Of The Caribbean clone again from Verbinski, and i admit, I’m in no hurry to see this thing either. The promotion of this film here in Australia has been abysmal, and the footage i’ve seen has done nothing to alleviate the feeling I had from day one that this was gonna be a Western Turd a lot like Wild Wild West was. Dear God, when will Disney learn. haha. Thanks for reading. I am glad that the review entertained. I really was disappointed and I already expected it to be bad.